Introduction: For fabricating dental prostheses that meet patients' demands and have good longevity and function, appropriate treatment planning and decision-making are required. Therefore, not only technical skills and clinical judgment of the dentist are needed, but also patients' attitude toward treatment plays a critical role in posttreatment satisfaction. Aim: The aim of this study is to investigate the factors affecting decision-making and the selection of dental prosthesis by the patients. Materials and Methods: A cross-sectional survey to determine patients' attitudes about replacement of teeth was conducted. 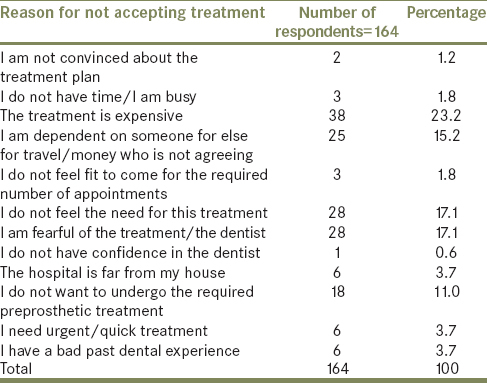 This survey was performed with the help of a prevalidated questionnaire, which contained the demographic data of every patient, whether or not they accept the treatment plan proposed by the dentist, and a close-ended multiple choice question stating the reasons cited by them if they decline the proposed treatment plan. Results: The data were subjected to statistical analysis by Chi-square test at a significance level of P< 0.05. A relationship between the demographical information such as age, gender, educational status, marital status, and monthly income of each patient and the single best reason opted by them to not undergo the proposed treatment plan was established. Conclusions: In the sample of population studied, most of the patients declined the proposed treatment plan and accepted the alternate one. High expenditure is the most common reason for this rejection. Today, a modern view of dentistry is one that recognizes the emotions or psychological essence of the patient in relation to the dental situation, dental health care, and especially, esthetics. We live in a social world and how we look influences our interactions with others. Teeth play an important role in the maintenance of a positive self-image. Tooth loss is very traumatic and upsetting and is regarded as a serious life event that requires significant social and psychological readjustment., It has been suggested that adverse reactions toward edentulousness as well as the individuals' feelings about dentures are important for the acceptance of the new dentures. For one particular clinical situation, many prosthetic treatment options may be available, namely removable, fixed, or implant-supported prosthesis. Traditionally, determination of prosthodontic treatment options and selection of treatment have been considered a part of the practitioner's professional responsibility. In contemporary clinical practice, patients are increasingly assuming an active role in determining their actual treatment needs by stating their expectations and constraints. In general, the three major areas that determine the acceptability of treatment are comfort, function, and esthetics. Mechanical and biological factors determine comfort and function. However, a variety of social and cultural influences, attitudes, and beliefs may determine patients' acceptance of the esthetic aspects of prosthodontic treatment. More emphasis is being placed on patient-mediated concerns in prosthetic treatment planning. Consequently, more information has been published on realistic treatment needs and socio-dental treatment needs of different populations. Patients' attitude toward treatment, measured by means of a questionnaire prior to the patients receiving the treatment, could be a prospective tool to determine satisfaction with the decided treatment. Deciding to get dental prosthetic treatment is expected to have a close relationship with demographic characteristics such as gender, age, education, economic condition, interest and expectation about health, and surrounding environment. In India, very few investigators have assessed the attitude of patients toward replacement of teeth. In addition, results from such studies cannot be generalized as population sample varies according to geographical location. Therefore, the purpose of this study was to assess decisions toward replacement of teeth among patients who reported to our institute, which is located in the Vidarbha region of the state of Maharashtra in the central region of India. A cross-sectional survey to determine patients' attitudes about replacement of teeth was conducted. Ethical clearance was obtained from the Institutional Ethical Committee. This survey was performed with the help of a prevalidated questionnaire in two parts. Part A consisted of demographic information such as name, age, gender, educational status, marital status, and monthly income of the patients, followed by clinical examination, which was recorded by one calibrated investigator to avoid operator bias. This part of the survey facilitated analysis of decision-making process adopted by the patient. Kuppuswamy's socioeconomic scale, which includes education level, monthly income, and occupation, was used to classify the socioeconomic status of the patients. Accordingly, the socioeconomic status was classified from Class I to Class V: Upper (I), upper middle (II), lower middle (III), upper lower (IV), and lower (V). Part B of the questionnaire consisted of a close-ended multiple choice question to be filled by the patient himself/herself. It was prepared in English as well as in the regional language Marathi to facilitate data processing and avoid ambiguity. The choices were a set of 12 most commonly cited reasons for not accepting or accepting an alternate treatment plan. These reasons were obtained by discussions with ten dentists. The sample consisted of a total of 200 patients (84 male, 116 female) between the ages of 18 and 88 years (mean age: 44.29 years). General characteristics of the respondents of this study are described in [Table 1]. It describes the demographic information of the participating respondents to be analyzed later. 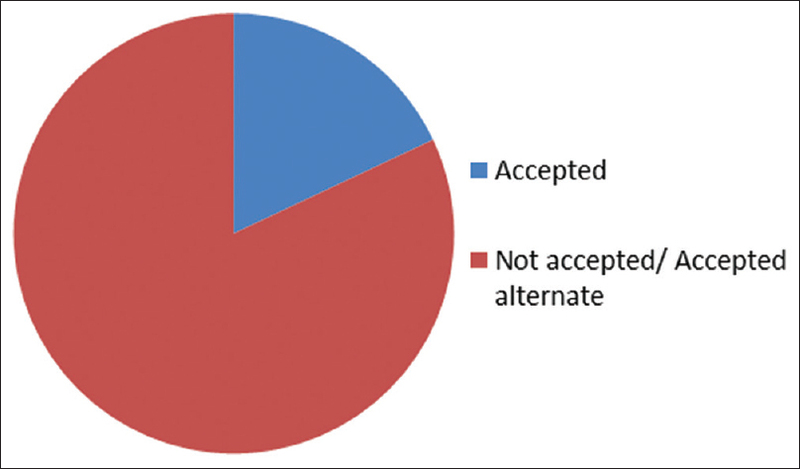 82 percent (164) of the total 200 respondents did not accept or accepted alternate treatment, while only 18% (36) accepted the treatment plan offered by the dentist [Figure 1]. Hence, for all further statistics, “N” means people who declined the proposed treatment plan (n = 164). The chief complaints of the patients causing a visit to the dentist are explained in [Figure 2]. Majority of patients reported with “appearance affected” as the chief complaint, and majority of these patients accepted the treatment plan. The causes of respondents declining to get the prosthetic treatment done are listed as 12 reasons in [Table 2]. The top five reasons included high expenditure (23.2%), fear of dental treatment (17.1%), not finding the need of it (17.1%), dependency (15.2%), and not willing to undergo the preprosthetic treatment (11%). They were then statistically analyzed using Chi-square test to obtain the test of significance between the variables. Statistical analysis between sociodemographic characteristics and decision-making of prosthetic treatment was performed to investigate factors related to the reasons cited by the respondents for not accepting the proposed treatment plan. Results of the descriptive statistical analysis between reason cited as “high expenditure” and age are statistically significant as shown in [Table 3]. There also exists a highly significant association between “high expenditure” and the income of the individual, but not with the socioeconomic status. Association table between “fear” and gender shows a statistical significance [Table 4]. There is also a significant association between “fear” and past dental experience [Table 5]. Association table between “do not feel the need” and gender shows a significant correlation with each other [Table 6]. Association table between reason cited as “dependency” and gender shows a statistical significance as shown in [Table 7]. No significant relation exists between dependency and age and with marital status. Finally, no significant correlation was obtained between the reason cited as “do not want to undergo preprosthetic treatment” and sociodemographic factors, besides age, which shows statistical significance. Human ability to adapt physically and psychologically to changes in oral conditions, and cope with its impacts is affected by external factors such as environment and social context. Tooth loss is associated with esthetic, functional, phonetic, psychological, and social impacts for individuals, and hence patients express a desire to replace their missing teeth. Various treatment options are available for prosthetic reconstruction of teeth, which may be removable or fixed prosthesis. Removable prosthesis includes complete dentures, interim and cast partial dentures, whereas fixed prosthesis includes crowns, bridges, and implants. The choice of prosthesis is a shared decision-making process between the dentist and the patient. Many investigators have studied the factors affecting clinical decision-making regarding choice of prosthesis by the dentists., Patients' satisfaction with prosthetic treatment once the treatment has been completed has also been studied. The literature also has research on how to effectively train dental graduates regarding clinical decision-making in prosthodontics. However, evaluation of the patients' decisions regarding the choice of treatment before beginning of treatment is less reported in the literature. This data pertains to whether patients accept the best suitable treatment plan given to them or opt for an alternative one and the reasons for the choice. Reasons can be many including age, cost, time, and fear of treatment. It is significant in many aspects. One being its implications in various government health-care policies that have to be strategized as ours is still a developing country, and these policies depend on the health-care needs of the general population. If we know the attitude toward replacement of teeth among patients and various factors influencing their decision-making regarding treatment options, measures can be taken to improve standard of care, especially in rural population. Patient compliance with the acceptance of prostheses can also be enhanced. In addition, depending on the outcomes of such investigations, research can be aimed at designing newer prosthesis/materials as per patients' needs and demands. The findings of the present study indicated that mostly females visited the department (58%), which points toward the fact that they are more aware of their dental prosthetic needs, confirmed further in this study [Table 1]. The age groups of the respondents were divided into the young age group as 18-35years (National Youth Policy, Govt. of India, 2003), old age group as 60 years and above (Gorman, 2000) and the rest as middle age group (36-59 years) for better understanding. Majority of patients declined proposed treatment plan (82%) as seen in [Figure 1]. The reasons given by them for doing so are enumerated in [Table 2]. Out of these, “high expenditure” was, overall, the most common reason people opted for when they chose to decline the treatment. Nearly, 71.05% of the people who opted for this reason were advised a fixed prosthesis, but they opted for a removable one, which is a cheaper alternative. Most of these patients were advised fixed prosthesis [Table 3]. The cost of a fixed prosthesis is already subsidized in the institutional setup, however patients still find it difficult to afford the same. Availability of indigenous materials (such as ceramics) which are affordable may change the scenario. Furthermore, dental insurance should find a place in the schemes proposed by the government so that people can afford to get the dental treatment most ideal for them. Although there was a highly significant association between reason for decline being “high expenditure” and income, it is worthy to note that there was no significant association between the socioeconomic status and high expenditure, which stresses the importance of education and profession on the decision-making ability of individuals. Nearly, 13.4% of the females gave “fear” as the reason for declining proposed treatment plan, as compared to 3.7% males, which indicates that females are more likely to be anxious regarding dental prosthetic treatment than men [Table 4]. Individuals with a bad past dental experience are more “fearful” of the treatment than the one with good dental experience [Table 5]. However, individuals with “no past dental experience” most commonly cited “fear” as the reason (39%), which means that there is a dire need of basic awareness and confidence-building measures about various dental treatment modalities. Males opted for the reason “do not feel the need of treatment” more than females (11.6% as opposed to 5.5%) which means that men are more likely to be unaware of the benefits of treatment and consequences of delayed or ill treatment [Table 6]. Dental education camps, use of print media such as newspapers, advertisements, banners, posters, and visual media such as short films and videos can be done for the same for creating mass awareness of the treatment procedures and their benefits. 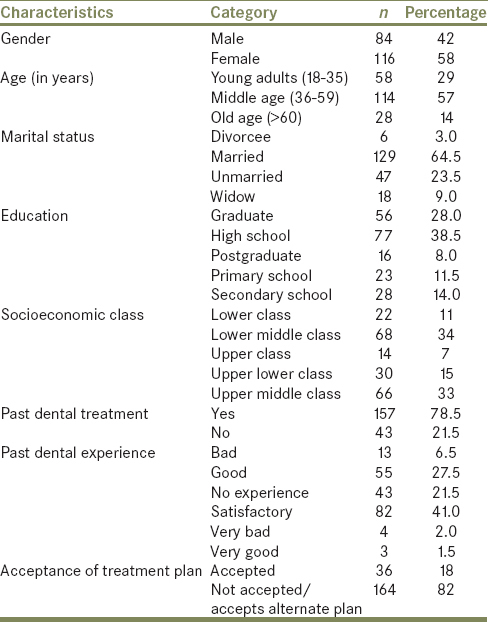 Females opted for the reason “dependency” more than men (12.2% as opposed to 3%) which shows that females are dependent on family members for their treatment expenses or for traveling to the dental care center, and these family members are not agreeing for the treatment, although the individuals themselves are [Table 7]. Mobile dental vans, providing on-site dental treatment, may be a feasible solution. Osterberg et al. reported that esthetic rather than functional factors determine an individual's subjective need for the replacement of missing teeth, which was confirmed in the present study. This means that the demand for replacement of missing teeth and acceptance of the proposed treatment plan are strongly related to the position of the missing teeth. More studies from the patient's perspective should be conducted so that we can formulate better policies which will aid in achieving the ideal treatment plan for the patients. There are few limitations in this study, namely limited sample size and institutional setup where prosthetic treatment charges are less as compared to private dental care centers. Therefore, to solve these issues, timely intervention in the form of efforts to increase prosthetic awareness of general population, provision of insurance policies, and research on economical materials is required. Levinson NA. Psychological facets of Esthetic dental health care: A developmental perspective. J Prosthet Dent 1990;64:486-91. Roessler DM. Complete denture success for patients and dentists. Int Dent J 2003;53:340-5. Omar R, Tashkandi E, Abduljabbar T, Abdullah MA, Akeel RF. Sentiments expressed in relation to tooth loss: A qualitative study among edentulous Saudis. Int J Prosthodont 2003;16:515-20. Fiske J, Davis DM, Frances C, Gelbier S. The emotional effects of tooth loss in edentulous people. Br Dent J 1998;184:90-3.
al Quran F, Clifford T, Cooper C, Lamey PJ. Influence of psychological factors on the acceptance of complete dentures. Gerodontology 2001;18:35-40. Leles CR, Freire Mdo C. A sociodental approach in prosthodontic treatment decision making. J Appl Oral Sci 2004;12:127-32. Conny DJ, Tedesco LA, Brewer JD, Albino JE. Changes of attitude in fixed prosthodontic patients. J Prosthet Dent 1985;53:451-4.
van Waas MA. Determinants of dissatisfaction with dentures: A multiple regression analysis. J Prosthet Dent 1990;64:569-72. Mishra D, Singh HP. Kuppuswamy's socioeconomic status scale – A revision. Indian J Pediatr 2003;70:273-4. Teófilo LT, Leles CR. Patients' self-perceived impacts and prosthodontic needs at the time and after tooth loss. Braz Dent J 2007;18:91-6. Carr A, Brown D. McCracken. Removable Partial Prosthodontics. 12th ed. Philadelphia: Elsevier Inc.; 2011. Shigli K, Hebbal M, Angadi GS. Attitudes towards replacement of teeth among patients at the Institute of Dental Sciences, Belgaum, India. J Dent Educ 2007;71:1467-75. Sangappa SB. Patient satisfaction in prosthodontic treatment: Multidimensional paradigm. J Indian Prosthodont Soc 2012;12:21-6. Deshpande S, Lambade D, Chahande J. Development and evaluation of learning module on clinical decision-making in Prosthodontics. J Indian Prosthodont Soc 2015;15:158-61. Jung HY. Factors affecting patients'decision-making for dental prosthetic treatment. J Korean Acad Prosthodont 2008;46:610-9. The Definition of Youth. National Youth Policy. Ministry of Youth Affairs and Sports, New Delhi: Government of India; 2003. Gorman M. The growing problem of violence against older persons. J Gerodontol 2000;9:33-6. Osterberg T, Hedegård B, Säter G. Variation in dental health in 70-year old men and women in Göteborg, Sweden. A cross-sectional epidemiological study including longitudinal and cohort effects. Swed Dent J 1984;8:29-48.